4,000 tons of bombs from morning to midnight, Germany given worst-ever air bombardment. Four thousand tons of bombs rained down on Germany on Wednesday and Wednesday night – the greatest ever bombardment ever made in a single dawn to midnight. And last evening RAF planes were heard going out towards the Continent again. According to Berlin radio later, “British bombers made a nuisance raid on Western Germany this evening. Bombs were dropped at several places.” Half of Wednesday’s tonnage was dropped by the American raid on Wilhelmshaven in daylight. 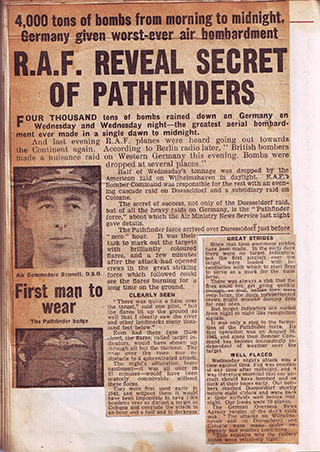 RAF’s Bomber Command was responsible for the rest with an evening cascade raid on Duesseldorf and a subsidiary raid on Cologne. The secret of success, not only of the Duesseldorf raid, but of all the heavy raids on Germany, is the “Pathfinder force”,” about which the Air Ministry News Service last night gave details. The Pathfinder force arrived over Duesseldorf just before “zero hour”. It was their task to mark out the targets with brilliantly coloured flares, and a few minutes after the attack had opened crews in the great striking force which followed could see the flares burning for a long time on the ground. “There was quite a haze over the target”, said one pilot, “but the flares lit up the ground so well that I clearly saw the river and other landmarks many thousand feet below.” Even had there been thick cloud, the flares, called target indicators, would have shown up through all but the thickest. The haze over the town was no obstacle to a concentrated attack. The night’s saturation bombardment – it was all over in 27 minutes – would have been scarcely conceivable without these flares. They were first used early in 1942 and without them it would have been impossible to have 1,000 bombers over so distant a target as Cologne and conclude the attack in an hour and a half and in darkness. Since that time enormous strides have been made. In the early days there were no target indicators , but the first aircraft over the target were loaded with incendiaries with which to start fires to serve as a mark for the main force. There was always a risk that the fires could not get going quickly enough or that, unless they were very large the more inexperienced crews might mistake dummy fires for real ones. But target indicators are varied from night to night like recognition signals. It was only a step to the formation of the Pathfinder force. 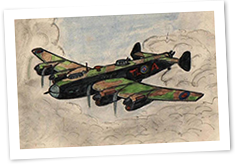 Its first operation was on August 18, 1942, and since then Bomber Command has become increasingly independent of weather over the target.